New in box shipped directly to your door in just days! With the Roma Food Strainer & Sauce Maker you can quickly and easily make healthy homemade sauces, jams, jellies, juices and even purees for baby foods from just about any fruit or vegetable imaginable. 1 year limited warranty included, terms and conditions apply. No more peeling or coring! The Roma Food Strainer & Sauce maker does it all for you! The Roma is so easy to set-up & use, it will become indispensable to cooks & gardeners alike. Now you can use fresh ingredients for all of your recipes & never worry about additives or preservatives again. Plus, with the separate purchase of the Two Speed Electric Motor for the Roma (as shown in related items to the right), you have the option of easily turning your manual tomato strainer into an electric one! 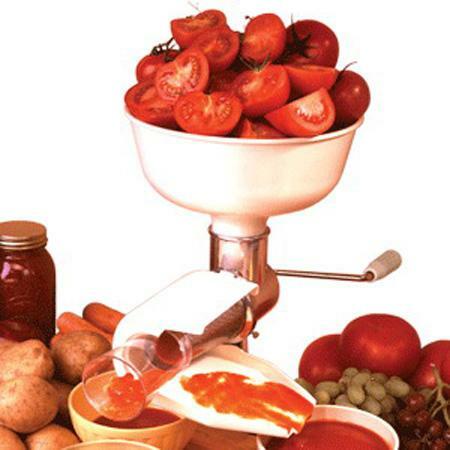 “The Roma Manual Tomato Milling Machine by Weston is great a entry level option into the world of tomato millers. This milling machine is priced for those who are looking at getting their first tomato miller and will be looking to upgrade for next year’s crop. The Roma manual tomato milling machine comes with an oversized tomato hopper. The hopper measures in at 9 and 1/4 in diameter and 4 inches in depth. The hopper is constructed from plastic and this does have a few downsides. The hopper may become stained by the tomato juice over time and the plastic could dry out over time. The neck of the tomato miller measures in at 2 and 1/2 inches in diameter. For your tomatoes to pass through the miller you will have to quarter them. The tomato feed spiral is constructed from plastic and the tomato milling screen is made from stainless steel. It is very important that you do not run this machine dry as the screen can wear down the tomato feed spiral. Roma includes a plastic screen extension that will transfers the tomato skin and seeds into your refuse bowl. There are additional screens and a grape spiral available for the Roma manual tomato miller that will allow you to tailor your machine to your specific use. The optional screens include a berry screen which has smaller holes to prevent smaller seed from entering your purée. There is also a pumpkin screen that is available that has larger holes to accommodate vegetables with stringy meat. The last optional screen for the Roma is a salsa screen. This screen will not separate the skin and seeds as finely as the standard tomato screen as it is designed to coarsely chop up the tomatoes for use in a salsa. One unique accessory for the Roma manual tomato miller, is the optional grape spiral. This optional spiral will also you to process grapes with seeds. The catch chute of the Roma manual tomato miller has a built in spray guard. The body of the Roma manual tomato miller is constructed from cast aluminum. The body of the tomato miller has two different ways to mount the unit to your counter top. The Roma includes a built in suction cup mount that will allow you attach this tomato miller anywhere on your counter top. We recommend placing a small amount of water on your counter top underneath the suction cup before you lock it down. This will help make a more secure suction to your counter top. The Roma manual tomato miller also includes a clamp that will allow you to attach the tomato miller to your counter top, if you are unable to form a secure suction with the suction cup base. The widest adjustment of the clamp is 2 and 1/4 inches in depth. No more peeling or coring - Simply turn the handle and the seeds & skins separate from the puree. Enjoy! All parts available from TomatoMilling.com upon request.